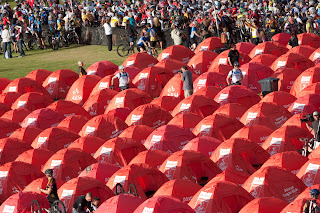 The final stage of the 2010 Cape Epic had arrived, and it couldn't have come any sooner for those still in the race. 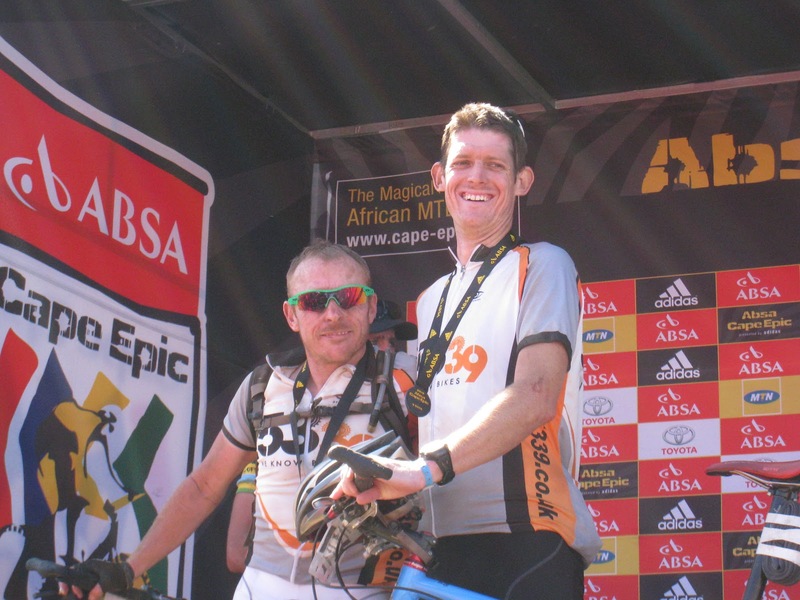 We had endured 7 days of some of the toughest and most technical mountain biking in the Western Cape, certainly the toughest riding in an Epic to date. A general air of excitement and anticipation filled tent city - we were just 65km away from Lourensford and the finisher's medal that awaited us. 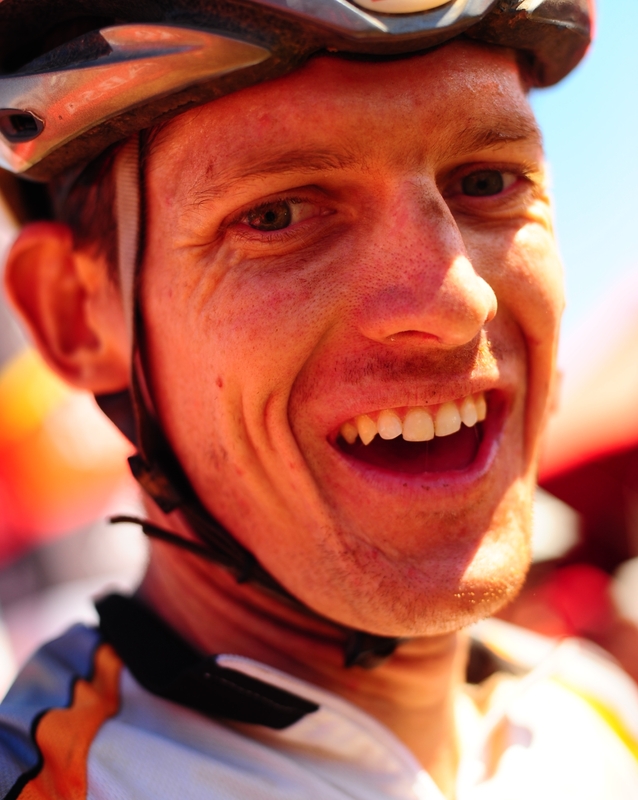 While there might have been a carnival atmosphere in the hours leading up to the start of the final stage, the final stage was not one that could be taken lightly. 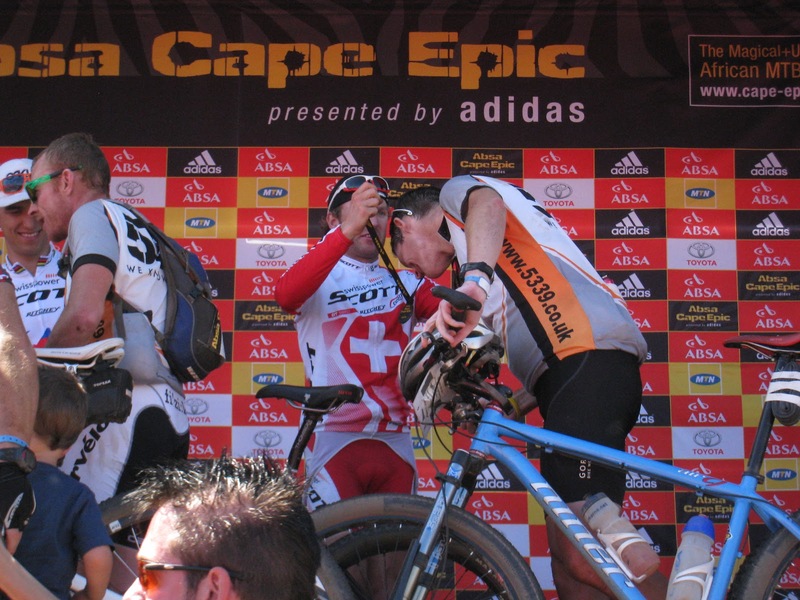 It really was the sting in the tail of what had been a tough Epic, and was the kind of stage that could ruin one's hopes of finishing. As is customary, the stage started a little later than previously, giving us some extra time to sleep in, enjoy breakfast and fiddle. The extra time flew by, and before we knew it the stage had started and we were climbing once again on tired, cold legs up the towards the old Viljoen's Pass. Lady Luck was smiling on me, and for the first time in three attempts I was able to ride up some steep concrete jeep track instead of having to push my bike up the climb. We made good progress up the old pass, and crossed over to the foot of Nuweberg. There had been a general sigh of relief that we weren't going to be climbing this monster, but Dr Evil wasn't going to let us get away without a little bit of pain and suffering. He had found a new climb that was higher, steeper and rockier than Nuweberg - Buysepad. Once again we found ourselves riding with the usual suspects, the Coach, the DropGoal Hero, the Pretty Boy, and Mr Stander. The more I saw of Mr Stander the more respect I had for him - he is not a small fellow, and yet he was climbing as well, if not better than the rest of us - doing his own thing at his own tempo. Very impressive. The final section of Buysepad kicked up quite steeply, and we were forced to carry/push our bikes. I was riding Nelly once again, and so far everything was going well. We were climbing well, we were fast on the flats, and relatively fast on the smoother descents. And then I found her weakness - the otherside of Buysepad is a rocky technical descent with no real line at all. I am embarrassed to say that The MountainBiker rode away from me on the descent, and did so looking like he was a natural. In fact, I think he even gave me a "what took you so long" look at the bottom. While he still hadn't found his elusive climbing legs, he certainly had found some technical skills and was making good use of them. A short stop at the only water point of the day where bumped into the Coach and we were off - 30kms to go. We got to the compulsory portage just ahead of our competitors, and had a leisurely stroll down Gantouw Pass, to the railway line that awaited us. Thankfully, it was nothing in comparison to the railway line of Stage One, and we were soon off it and flying downhill towards Vergelegen and the ridiculous "no over taking zone". If we could get into that zone ahead of our competitors, we would stand a good chance of finishing ahead of them. To do that, we would have to get over the horrible little climbs that preceded the zone. With my hand planted firmly on The MountainBiker's back we flew up the hills and managed to open up quite a nice gap. After leaving the "no over taking zone" we had a short flat time trial to the finish. 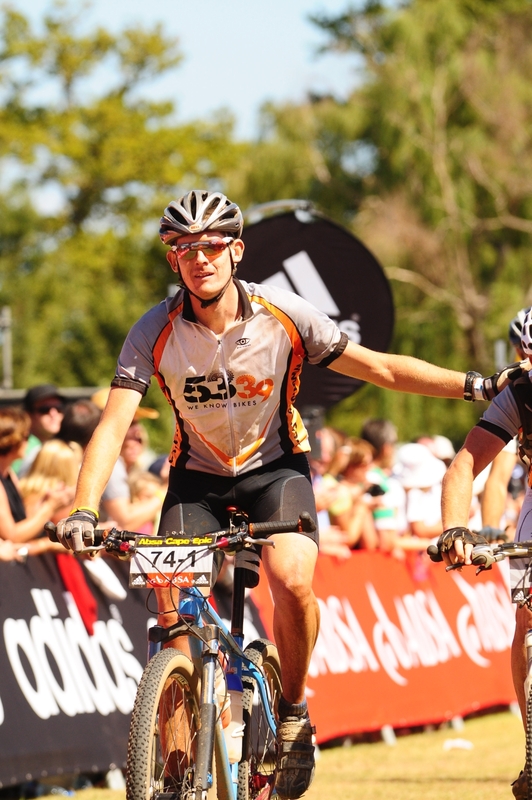 With The MountainBiker tucked in behind me we flew over the wide flat dirt roads, past a rather grumpy and tired Yolanda (who had done a 50km race in Lourensford and was probably close to being in last place) and onto the finishing straight. 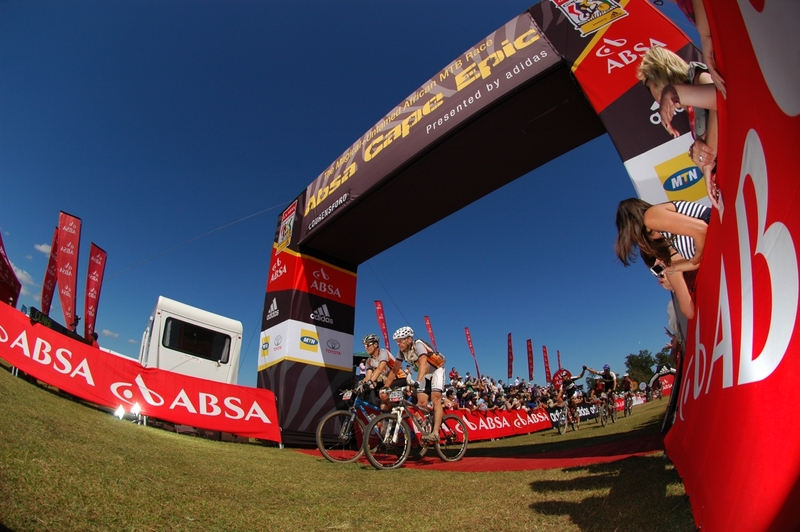 It is quite a strange feeling riding up the grass finishing straight - it is not a thought you want to entertain at any time during the Epic in case of jinxing you race, and yet when it finally happens it feels a little weird - almost unwanted. 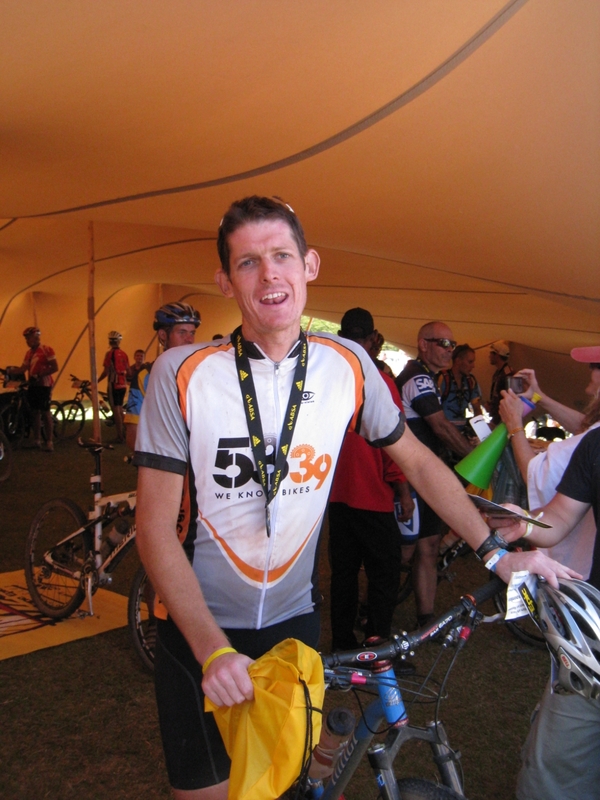 Just like that, the Epic is over - eight long hard tough stages, some good times, some bad times - all come to an abrupt end. While the finish is most welcome, it also signifies the end to yet another great adventure through the Western Cape. 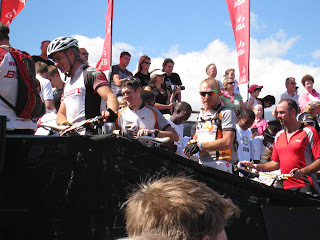 The MountainBiker and I - 2010 Finishers. The MountainBiker and I had survived - there were definitely times when we both thought that he wouldn't make it, but being the tough little rider that he is, he stuck it out, gritted his teeth and crossed the line like a true champion. 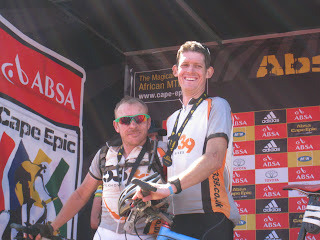 Well done Russell, and thanks for a great Epic.